I’m writing this article in memory of my favourite airtel brand logo and alluring jingle tune. If I could write a post it would be a kind of “RIP” word feeling for my beloved old brand. Airtel Africa crossed over 50 mln customers across 16 countries. (Year ended Nov 2011) .Revenue of the company INR 59,467 crore (2011).Bharti airtel is the 5th largest telecom operator with over 230.8 mn subscribers across 19 countries as of June 2011.It is the largest cellular service provider in India with a subscriber base of 174.69 mln(End of Nov 2011). This is probably the 2nd largest investment on rebranding exercise after Reliance infocom. Bharti Airtel spent around INR 3 bn (USD 67 mn) on rebranding of its operation in Indian market and foreign market. While extending its business to African territory (15 African units), It has adopted Kuwait-based “Zain group” an enterprise value of $10.7 bn in June 2010. The acquisition added 40 mn mobile phone users from African territory to airtel subscriber base over 130 mln. It was the cover story. How should we measure the success rate in Brand Management? Market analysts like using numbers to pad up their arguments because numbers seem hard and fast. But they don’t always agree on it. Last November, the time was to create brand allegiance among its unexampled customer base. While pacing towards a global branding phase and giving it an international motif, Airtel launched its new-fangled logo and a new signature tune. It was outlined as a “youthful” brand and international in appeal. Modifications in the logo and jingle brought in lots of mixed responses. The new logo of Airtel was designed by Brand Union a London based company. It was a matter of twist and turn at that time because the other client of the group was Vodafone. Although the new logo was not badly excogitated (especially font). The color and the design scheme are bit confusing as Vodafone and Videocon has strongly associated with it. If you will interrogate or question any marketing or brand manager he will definitely exhibit you with the term “Brand recognition”. Wasn’t able to recreate the differentiation? We are well aware about consumer, who always postulates for an upfront motive, they will not stand till end of the day. While the investment (3 bn) on rebranding made it more critique centric by that time. Most of the experts termed it as completely an imitation of Videocon and Vodafone. 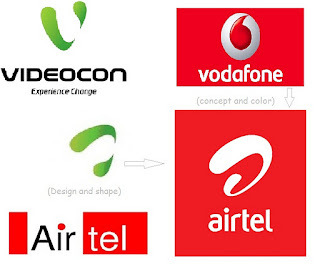 One of my colleagues told me that “Airtel and Videocon is sister companies based on their logo”. Of course, the statement was desirable. Although it was in Airtel’s favour as it is more popular among its user, which could help them out in the brand positioning context. But most of the Indian subscriber’s clicked un-follow button on their social sites. Tweets and Facebook status messages amounted as “old symbol was far better than the new one, after all they look for is a symbol (to suit global young gen image). Don’t you think the old Airtel logo would have sufficient for that? Do you really think there would be someone in a interior place in India or in Africa who would go for a mobile phone/sim and provoked to purchase one by seeing this new symbol? I don’t think so...it was the minute expression everywhere. Is it all about a company emblem and signature tune which induced this context into a distraction spot? In those days, aroha for the old logo and tune was on full swing. As per some reliable research report the customers believing that it has destroyed the entire experience Airtel’s previous tune had set up. The complaint are very simple from the subscriber’s i.e. “with intention to go international and please global audience, a company must not lose the local flavour”. People say’s Airtel has already crossed the mark in India and moving forward with its global extension plan suits the company. That was the rationality behind the spent over 300 cores on rebranding .Yes, their investment money will be recovered by high 3G tariffs and lower FUP limits. Is it reckons beneficial for a mature brand on every aspect? It is of sure that they have done their research before the launch of new logo and signature tune. They haven’t known it; a brand should always provoke pleased interest and distracts you from worries and vexations. Bharti Airtel CMD Sunil Mittal said, “The brand needs to speak to different countries. Think internationally. The brand has to connect with the youth in the geographies that we are in”. It was not only a susceptible answer but proves to be a oppugn that seems to favour the decision. What about those thousands of loyal customer and their earlier objections. Here lies the archetype problem, it would take seconds to verbalize about the logo and jingle tune. These two affairs were the generator of the distraction among its loyal customer base in India. If you will reread recent brand up-downs, brand “GAP” has also suffered the same in the early decades and took back the revamping exercise after a lot of negative responses. I had never seen such a case until I came to know about the Airtel rebranding exercises. I was ready to pop the question, “should Airtel follow “GAP”. The story had some twist and turns, people are genuinely remembering the brand and keeping alive its value. So I thought, Airtel wants to keep this much popular motif, and then they should make sure of its acceptability with the changing generation. Brands like Mercedes, Apple, Microsoft, Coca Cola and FedEx are still enjoying the brand marathon with their brand recognition. Bharti Airtel’s decision was up to mark and appreciable but it should extend its research to make it fittest because the fittest always evolve to survive. After all Airtel is best at its customer service as their service is by far the best in the industry. They should capitalize their available opportunities and utilize their brand value on this way to communicate in a good order. Putting the logo and tune in the scapegoat position always been the controversial topic. If a company shouldn’t able to give the same perception in all the countries they set foot into. It would be called as a case of miscarriage in the positioning segment. This time it is India-African region, may Brazil and Siberia next time. The company research objective should always remember this as a rule of compulsion. But a few weeks later we had all accepted and probably even started liking it. It doesn’t affected airtel’s brand value at large in India but on a global frontier it has done its job. If you will check the after sum of re-branding exercise, airtel reported a decline of 41 % in its consolidated net income 1330.3 crore from 2149.9 crore. It’s all due to rebranding cost, net interest cost, forex loses and higher spectrum charges. Bharti Airtel ltd. had revenues for the full year 2011of 594.7 bn; this was a total 50.1% above than the previous year results. Yesterday, Mr. Mittal told to CNBC -TV 18 that Bharti Airtel margins have under pressure due to high cost of operation and it has been from the last 2 years. However, this welcome growth will become more meaningful when the company’s return on investment is reached and a larger number of people of all socio and economic groups across different territories affirm solemnly. The early decade changes no more a matter of concern and airtel is pacing well with its brand new campaign “har ek friend zaroori hota hai ’. Rebranding of Airtel was a successful case study or not? Nice All the reasons are really worth to be remembered, i will surely take care of it in my future. The deign of airtel's logo is unique, nice and classic as well. I also use airtel,and I must say it provides very good services. Just one observation: Despite all the efforts, the old jingle remains in our minds. How can the rebranding exercise be called a success when - on thinking Airtel - you recall the old jingle? Amazing! This is the service marketing sphere... I dont think brand associations have that powerful an impact in this space! NO amount of association is going to get you business if your network isnt upto scratch, or if customers buy solely on price. Airtel is Airtel not because of its advertisements or its jingle - it is Airtel basis the services it provides. Friends? Any mobile service lets you contact friends! Getting in touch with parents? Any mobile service does that! Where is the differentiator? What core feature of the product / brand is being re-inforced, aside from targeting young customers? That could have been done equally well with the old jingle and logo! Sorry friend, but I cant see the light here... update me if I am wrong - esp as I am a hard-core sales guy! Thank you so much for the brief comment. 1)I would be glad to say that it is a matter of discussion and I do appreciate your observation and also support it.But we need wait till the press report of financial year 2011-12.
result.We can't judge upon recent fickle whether. 3)Yes,you are absolutely right. "Airtel" is known for it's service and it is also a business strategy or you might call it "Brand strategy".It is also a part of "Re-Branding exert". About logo and jingle,they got your eye ball's that's all they want right here.. Interesting stuff!It's great to raceive this info You are realy fair and balanced. duration then it should be completed at any cost and under any circumstances. We want to incorporate what we love and what resonates with our higher purpose with what we choose. Word of mouth is one of the best types of advertising available.